Shayan Zadeh is founder and CEO of Leap Rail, an artificial intelligence startup helping hospitals to run more efficient and streamlined operating rooms through power of machine learning and predictive analytics. Shayan received a Master in Computer Science from University of Maryland and an MBA from University of Washington. He has been named to 40 Under 40 list by San Francisco Business Times and Alumni Hall of Fame by University of Maryland. His companies have received honors such as "The Next Big Thing" by Wall Street Journal and "Inc5000" by Inc Magazine. Shayan has been granted 8 patents by United States Patent and Trademark Office. 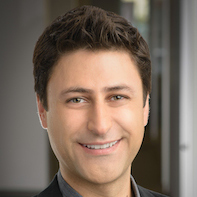 In addition, Shayan is an angel investor and advisor to startups including Polymath, Medopad, Sherbit, Mavatar, SnapShip, PaperKarma (acquired by reputation.com), Identified (acquired by Workday) and AppComputing. In his free time, Shayan enjoys bicycling, tennis, and playing with his Doberman Pinscher, Ivy. Patent #US9917761 - System and method for providing guidance to a user of a website or application. Shayan Zadeh, Joshua Royse, Danielle Chandler, Jared Crane, Ryan Koziel, Eric Barnett. March 2018. Patent #US9838400 - System and method for validating users using social network information. Alexander Mehr, Shayan Zadeh. December 2017. Patent #US9716705 - System and method for verifying user supplied items asserted about the user for searching and/or matching. Alexander Mehr, Shayan Zadeh, Jared Crane, Joshua Royse. July 2017. Patent #US9230103 - System and method for registering users for communicating information on a web site. Doug Wehmeier, Alexander Mehr, Shayan Zadeh. January 2016. Patent #US9391974 - System and method for verifying user supplied items asserted about the user. Alexander Mehr, Shayan Zadeh, Jared Crane, Joshua Royse. July 2016. Patent #US9466064 - System and method for locating desired traits in resources using a network. Alexander F Mehr, Shayan G Zadeh. October 2016. Patent #US8606646 - System and method for selling products and services via a network of at least three computer systems. Doug Wehmeier, Alexander Mehr, Shayan Zadeh. December 2013. Bring on More Immigrant Entrepreneurs. Shayan Zadeh. In Wall Street Journal. November 2013. Patent #US9639695 - System and method for validating users using social network or other information from a web site. Alexander Mehr, Shayan Zadeh. October 2013. Doing A Startup? Get Ready To Screw Up And Start Over. Shayan Zadeh. In Forbes. May 2012. Security-Aware Adaptive Dynamic Source Routing Protocol. Shayan Ghazizadeh, Okhtay Ilghami, Evren Sirin, and Fusun Yaman. In Proceedings of the The 27th Annual IEEE Conference on Local Computer Networks. Florida, November 2002. SEuS: Structure Extraction using Summaries. Shayan Ghazizadeh and Sudarshan Chawathe. In Proceedings of the The 5th International Conference on Discovery Science. Germany, November 2002. Discovering Frequent Structures using Summaries. Shayan Ghazizadeh and Sudarshan Chawathe. Technical Report CS-TR-4364. Computer Science Department, University of Maryland, College Park, Maryland 20742. November 2001. A New Protocol for Asymmetric Communication Channels: Reaching the Lower Bounds. Shayan Ghazizadeh, Mohammad Ghodsi, and Amin Saberi. In International Journal of Science & Technology: SCIENTIA IRANICA, 8(4), 2001. Transforming English Sentences into First Order Predicate Calculus and Vice Versa. Shayan Ghazizadeh and Okhtay Ilghami. B.Sc. Project, Sharif University of Technology, 2000. © Shayan Zadeh. Design: HTML5 UP.